I had two sweet potatoes left from my Boston Organics delivery, so I decided to try to make sweet potato gnocchi. The only other time I had ever made gnocchi was when I made the ricotta gnocchi for the Daring Cooks challenge back in May. That was definitely a pretty complicated recipe, but the sweet potato gnocchi recipe in Mark Bittman's How to Cook Everything was a lot simpler. That recipe didn't mention what sauce to pair with the gnocchi, though, so I turned to Google for some inspiration. 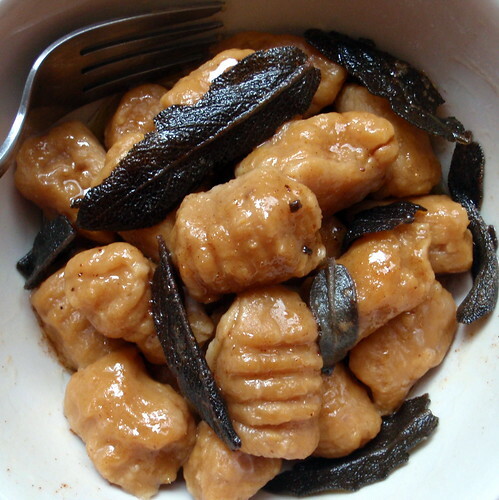 The first hit for a search for "sweet potato gnocchi" was Giada's "Sweet Potato Gnocchi with Maple Cinnamon Sage Brown Butter". Can you say yum? Peel the sweet potatoes and cut into small 1" chunks. Place in a microwaveable bowl with a little water and cover. Microwave for five minutes or until the sweet potatoes are done. Drain, season with salt and pepper, and mash with a fork. Add about a half cup of the flour and stir. 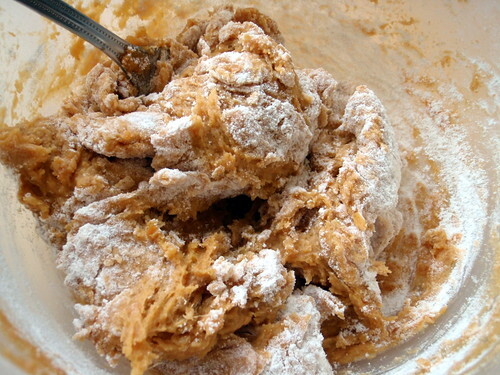 Continue adding the flour in small increments until you get a dough that you can handle. 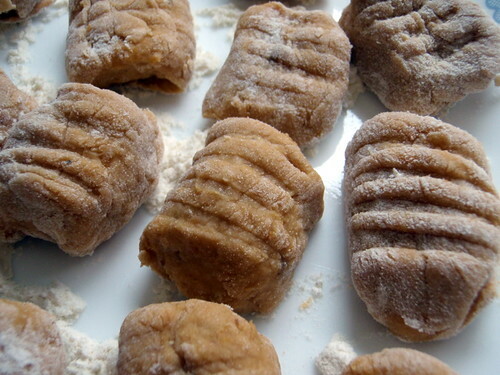 You want to add as little flour as possible to keep the gnocchi from being too dense. Pinch off a small piece and drop into boiling water to make sure it will keep its shape. Place the dough onto a floured counter top (or cutting board). Divide in half and roll each piece into a 1/2 inch wide snake. Cut the dough into 1 inch long pieces and roll over the tines of a fork. Place shaped pieces onto a floured plate without them touching one another. Cook the gnocchi in the boiling water in batches. You don't want there to be more gnocchi in the pot than can cover the surface of the water. The gnocchi is done about a minute after it starts floating. While the gnocchi is cooking, melt the butter in a separate small saucepan. 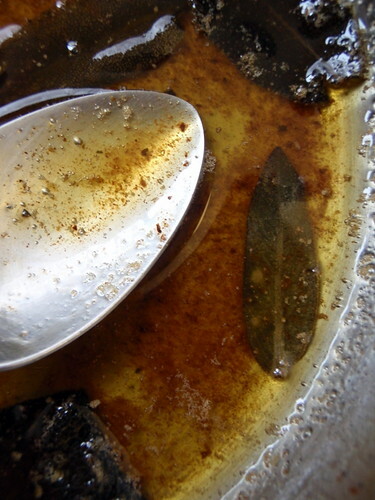 Once it is melted, add the sage leaves and continue to cook until the milk solids in the butter have browned. Remove from heat and add the maple syrup, cinnamon, nutmeg, and salt to taste. Toss the cooked gnocchi with the browned butter sauce and serve hot. Leftovers can be refrigerated and pan-fried the next day for a slightly different texture. 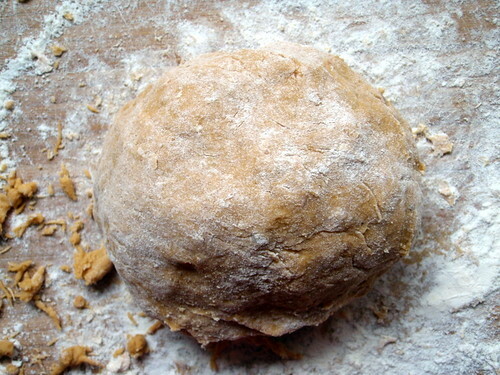 I found dough could be quite sticky and gluey before I finally added enough flour for it to be workable. In hindsight, I probably should have drained the potatoes better before adding the dough. While this gnocchi was considerably heavier than the ricotta gnocchi I had made before, it was still a lot lighter than say, the big, thick Shanghainese and Korean rice cakes. The gnocchi itself didn't have much flavor, but the brown butter sauce more than made up for that. I really liked how the sage and maple syrup brought out the flavor of the sweet potatoes. What kind of surprised me was that I actually wanted to add a little more black pepper to this dish even though I normally don't really like black pepper. I had some leftovers, which I pan-fried in the butter sauce (no additional oil needs to be added), although I removed most of the sage first and added it back in when the gnocchi was almost done so that it didn't burn. While I did like the light crispiness the pan-frying added to the gnocchi, I think it was better overall when it was fresh. Oh my delicious! Just imagining the flavors of the sweet potato with the maple cinnamon sage is truly making my mouth water! I love it! And those gnocchi are so pretty. I still have not mustered up the courage to make my own gnocchi. Does your gnocchi turn out soft and pillowy or chewy and "QQ"? 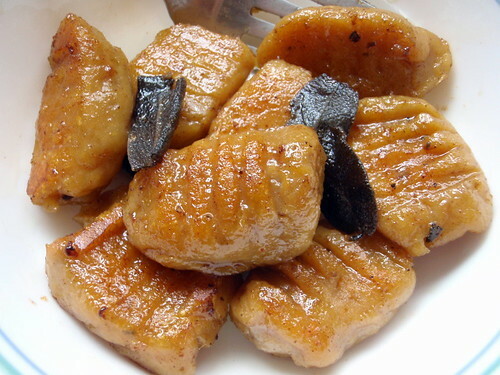 TUK - "QQ" is exactly the right way to describe these gnocchi! Too bad there's no English translation for the term. The ricotta gnocchi that I made last time were more on the soft and pillowy end. I made this tonight after searching for "easy sweet potato gnocchi recipe" on the internet. I really like how you suggest cooking the sweet potato in the microwave; it's a lot easier and faster than boiling or roasting the whole potatoes and then scooping out the pulp. I added a bit of nutmeg and cinnamon to the dough for added flavor and used a reduction of apple cider and a splash of brandy as the sauce. I also pan-fried the gnocchi; I really like the crust the gnocchi get that way. Overall, it's a great, quick recipe. I like sweet potatoes a lot more than white potatoes, so I eat them often. This is a great way to use them! Thanks! It's such a joy, Joy, to find blog soul-mates... cross-country, no less! I have been on a gnocchi kick (beet, sweet potato, and herbed) over the past several months. I can't wait to see more of your culinary experimentation!